My mother’s house has always been full of fabric. Mom is a quilter; she made clothes for me when I was very little, but most of my childhood memories of her sewing are of a hand-pieced, hand-quilted bed cover for me, covered in flowers and cows and bright colors. It took her eleven years to make, working on it in little bits and pieces on summer vacations and sunday afternoons when the “quilty ladies” would gather, sometimes at our house. She came into my first grade classroom to teach us how to make little nine-patch quilts; as far as I can remember, mine lived on a cat bed for years until it finally got so disgusting that we had to throw it away. I never had much interest in sewing myself when I was a little kid, but I loved helping her pick out fabric, and I loved all sorts of other crafts – beads and lanyard and friendship bracelets, classic summer camp fare. I did always love clothes – I played dress up in Disney princess costumes and my grandmother’s nightgowns from the 50s, I dressed up stuffed animals and barbies and friends, and eventually moved on to American Girl dolls (widely acknowledged to be the gateway drug to history), and drew pictures of outfits inspired by my favourite book characters. I was a crafty kid living in a sewing house; I think it was inevitable. I eventually decided I wanted to learn how to sew when I was fifteen and wanted to dress up as a Jedi for halloween. I wanted it to look as much like the real ones as possible so I did my research; found a pattern, looked at a ton of pictures, read the tutorials on early cosplayers’ blogs. Mom took me to buy fabric from a little hole-in-the-wall place in Brooklyn that she had been going to for years. She showed me how to press and cut the pattern pieces, and how to use her 1930s Singer Featherweight sewing machine, and then told me to follow the directions in the pattern and that she didn’t make clothes anymore and that was it. She helped me if I needed it, but for the most part I fumbled my way through that first pattern myself. I had unintentionally chosen a really good first project; it was a simple t-shaped garment with some borders, and I enjoyed the puzzle of putting it all together. I especially enjoyed the satisfaction of wearing a garment that I had made myself – that I had transformed from a flat piece of cloth into something I could put on my body. I was hooked after that. When later that year I became obsessed with The King and I and Gone with the Wind, I had no hesitations in deciding that I could make my own ballgown. That was when I started catching the fashion history bug; I hated learning about wars and politics in history class in high school, but on my own I wanted to learn all about what everyday people in history did – what they ate, what they did for fun, and especially what they wore. I was also struggling at the time with being a fat teenage girl who didn’t want to dress like everyone else. Because I didn’t REALLY want to wear velour track suits and tight shirts with flirty slogans on them, I had spent years of feeling out my sense of style shopping with my grandmother at Kohl’s, wearing A-line dresses and trumpet skirts that were clearly meant for suburban middle-aged women who worked in offices. In a time when conformity was encouraged and plus-size options were limited, the ability to make my own clothes was LIBERATING. I embraced my childhood love of poodle skirts and decided I wanted to be a Rockabilly. I discovered Vintage Vogue patterns and used them to make myself 50s dresses in bright colours and bold patterns. I finally took some proper sewing and fashion design classes at FIT in their weekend program for teens, and made myself some more dresses, a crappy civil war ballgown, and a red trench coat to dress up as Carmen Sandiego for halloween. And, at the end of junior year, I sold my beloved American Girl dolls and used the money to buy my first Renaissance Faire costume. 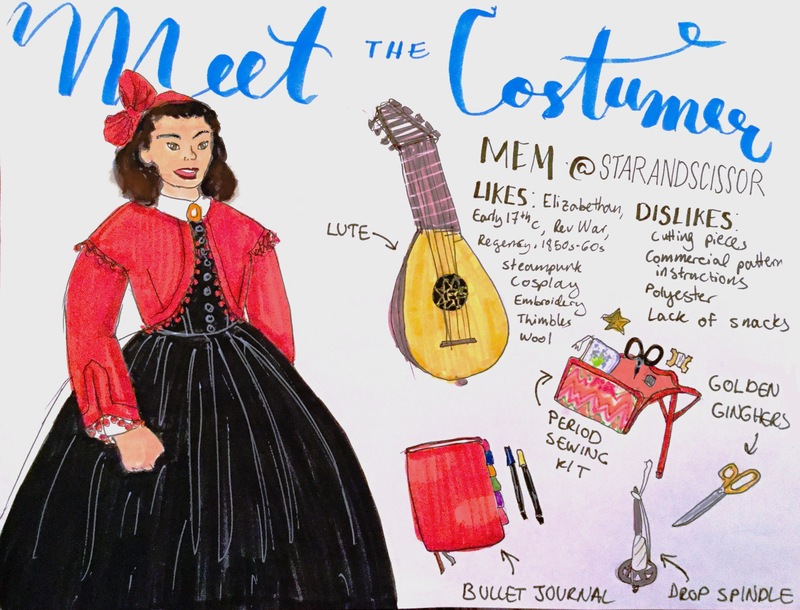 I went to college for costume design for theater, but only because I couldn’t find a program that would let me study fashion history as an undergrad. 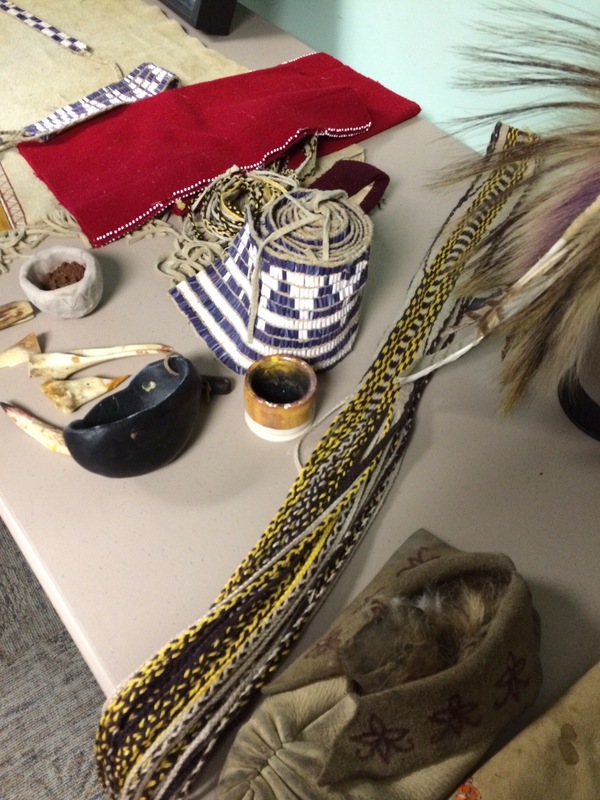 It turned out to be a good move; I learned how to build all sorts of garments and craft objects, I learned how to drape and pattern, and I learned the costume shop attitude of ‘everything is a transferable skill so you can figure out how to make anything’. But I was always the one who did way more research than necessary, and wanted to do things with historical rather than theatrical methods. The most formative experience came senior year: I studied abroad for a semester in London. The program was the Rutgers Conservatory at Shakespeare’s Globe, and the advisor of the design program was the incomparable Jenny Tiramani. We began the semester in the midst of production on the Globe’s 2012 Richard III and Twelfth Night. These were ‘original practice’ productions, meaning they were intentionally done as closely as possible to Elizabethan theatrical practices as could be managed – they had all-male casts, and beautiful hand-sewn costumes made of custom made textiles. Over those three months, Jenny gave us insight into all of the research and experimentation that had gone into creating these incredible productions. 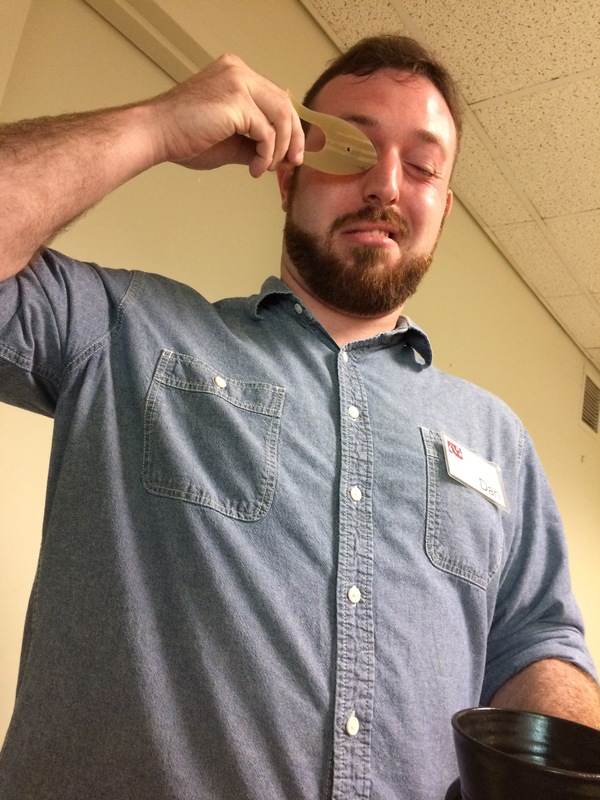 We took a Shakespeare literature class where we examined a play for the clues in the text of how it was originally staged. We took a props class where we ground our own mineral paint pigments and made casts of our faces using burlap and wax. 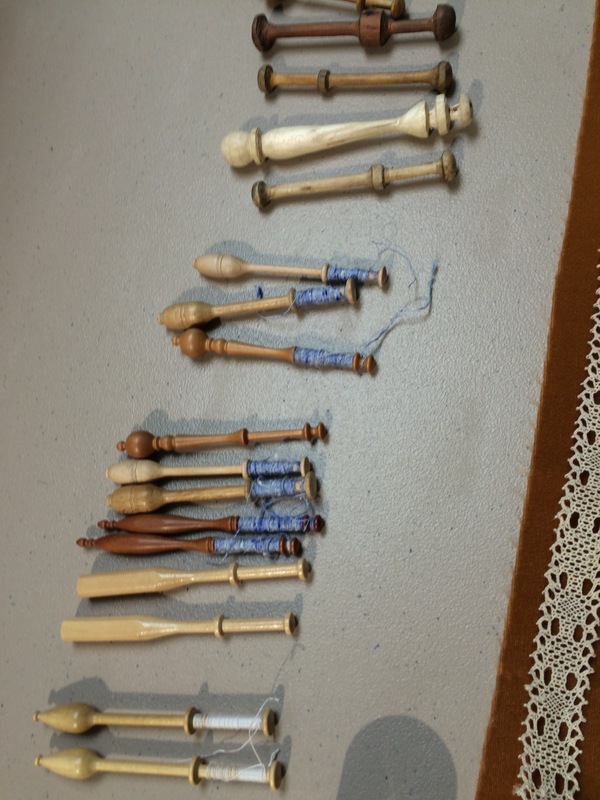 We went to museums and historic sites to look at portraits and extant garments and original furniture. And we took an Elizabethan costume construction class where we built a pair of beautiful silk sleeves, and sewed, starched, and set ruffs. My ruff was my first entirely hand-sewn garment. We set our ruffs at Jenny’s little house in Shoreditch, which was packed full of books and papers and fabrics and artifacts and cabinets full of Janet Arnold’s files. She showed us a project she was working on – a suit made of strips of red and yellow silk, recreated from an illustration in a German fashion book from the 1580s, with an extremely shallow-crowned hat that they were still trying to figure out how it stayed on your head. This was it, for me. There were people out there putting all of this effort into figuring out how clothes were really made and worn in the past, and then DOING it. And I wanted to be one of them. Jenny taught us that we can never know everything, but the more detailed, the more specific you can make your research and interpretation, the more real it will be to the audience. This struck a chord with me in a way nothing else I was taught in school had. That was what set me on my current path. 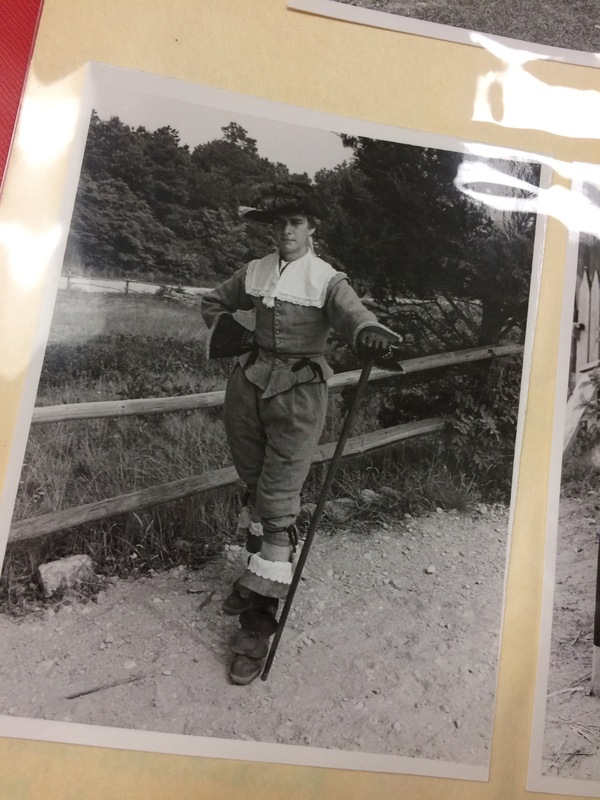 I got a job at Colonial Williamsburg right out of college, went to graduate school for fashion history, and now I work at Plimoth Plantation, a museum that is world-renowned for first person interpretation. I’ve come to love the community of people who recreate historic fashion – it’s very affirming to know that there are other people who love it so much that they have dedicated their lives to the study and practice of it (see, family? Playing dress-up is a viable career choice!). And I absolutely LOVE creative transformation of historical fashion – I know many historic costumers have mixed feelings about such things, but I love steampunk and cosplay and renaissance faire costumes (most of the time), they’re great outlets for my love of fantasy and flare for the dramatic and whimsical (you can take a girl out of the theater…). I hope to continue on this path for the foreseeable future – it turns out I have really strong convictions about the subject! And I hope to keep making connections with all of you awesome people who love it too. Like many costumers, I dabble in many time periods. 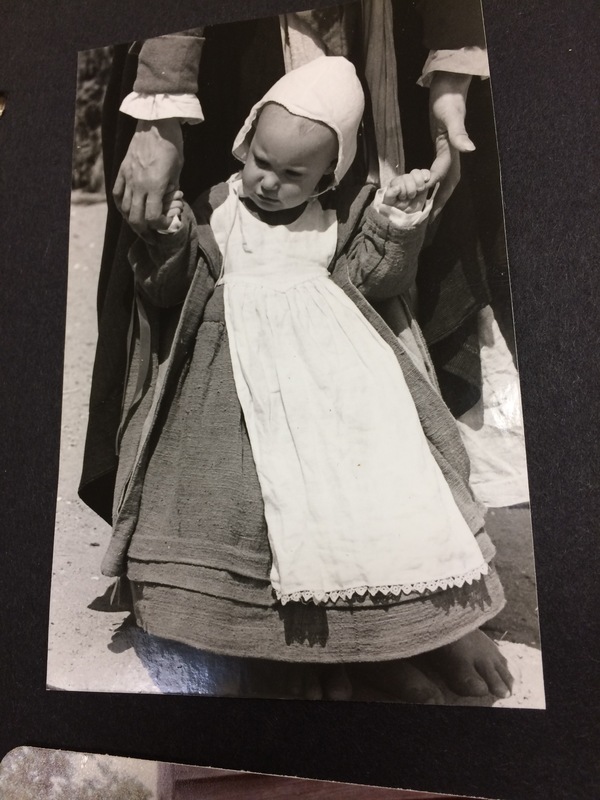 Some I have loved for a long time; having attended my first renaissance faire at the tender age of 4, I’ve always had a fondness for the Elizabethan era. Some I have come around to after a long period of skepticism: this actually applies to several periods that I’m now interested to in – Regency I never thought I could wear because I’m a big girl and only got into because of dance, late 18th century I never liked because I couldn’t see past the ridiculousness of the giant panniers on French court gowns and never knew any better, and and the 17th century just struck me as a low point between the extreme fashions of the 16th century and the extreme fashions of the 18th century, until I started working in a museum where I had to study it more closely. But the period that I consider to be my favorite is the period that got me into historical costuming in the first place, and that is the crinoline era, or approximately 1855-65. Ironically, it’s the period that I know the least about in terms of detailed historical context; I’ve never really had any occasion to study it – I’ve never even been to a civil war reenactment! But I’ve always loved the bold shape and dramatic scale of the crinoline. It began with a resurgence of love for The King and I when I was in high school – it had been a childhood favorite movie, but at age 15 I decided I loved the character of Anna, and I loved her clothes. I became obsessed with the story – I watched every movie version I could find and read Anna Leonowens’ real memoirs, any biographical information that I could find on her, and the 1939 Margaret Landon novel all the movies are based on. I also took a ballroom dance class which cemented my love of the polka. One of the happiest moments of my teen years was getting the 50th anniversary remastered DVD and discovering that this gown was not in fact pink, it was gold. I bought my first hoop crinoline sophomore year, and made a gown to go over it for a friend’s masquerade-themed Sweet Sixteen (this, for better or worse, was my second ever machine-sewn garment) – it was made of polyester crepe-backed satin with crappy lace and metallic ribbon from Jo-Ann Fabrics, and the pattern frankensteined together from a Simplicity Civil War dress and a Butterick halloween costume. I was totally out of place at my friend’s party when everyone else was wearing cute party dresses with masquerade masks, but I felt majestic. This is a friend wearing my first dress at a ball a few years later; you can see it’s a huge disaster in terms of accuracy, though Aubrey rocked it. I’ve come a long way since then in terms of research and construction, and I still have a great love of this period. My next gown after that was made from an original Harper’s pattern, and my most recent one based on a Tissot painting (long-time followers of this blog have seen my Young Woman In A Red Jacket ad nauseum). I unfortunately don’t have much opportunity to wear this period anymore – I used to go to balls and dance workshops fairly regularly when I was in college, but in my current job I’m rarely free on weekends to go to events. I do already have a couple of projects lined up, though, just out of love – I recently bought a white striped voile for a Tissot-inspired sheer that I’m very excited about! I’m going to close this post with some of my favorite crinoline era images, and very self-indulgently include a few of me as well. Other than that, until next time! This is my Harper’s dress! A photo in my files that just makes me happy. I don’t remember where it’s from. 1851 archery jacket – Museum of London. I love the idea of archery as an acceptable sport for Victorian women and I definitely want to recreate this one day! 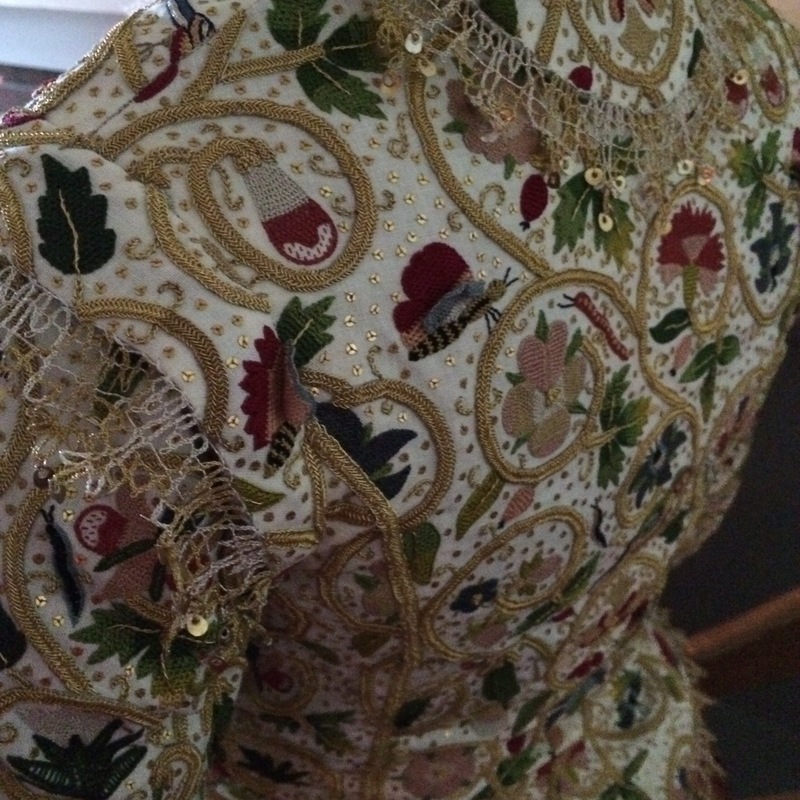 Front of an 1840s gown. Look at those tucks! This will be a quick post; in a shocking turn of events, I&apos;m not actually working on very much right now! At least not in the way of sewing – my big effort this year has been learning to play the lute. Everyone who talks to me on a regular basis has heard me go on and on about it endlessly, and my poor housemates have had to deal with living with a beginning musician. I&apos;ve done a lot of vocal music in my life, but never really any instrumental music, so this has been a VERY new experience for me. I&apos;m currently learning out of a book, but I&apos;m hoping in the next few months to find an actual human to learn from. I chose the lute because it was a popular instrument in several of the periods that I&apos;m interested in – my lute is a renaissance lute, good for late 16th and early 17th century music, and lute music continued to be popular through the 17th and 18th centuries as well (though the form of the lute changes a bit – more strings, weird necks, etc). I also chose it because it will be good to accompany myself singing. AND, best of all, there are lots of period images of women of all different social situations playing lutes. My actual current sewing project is making myself a lute strap. 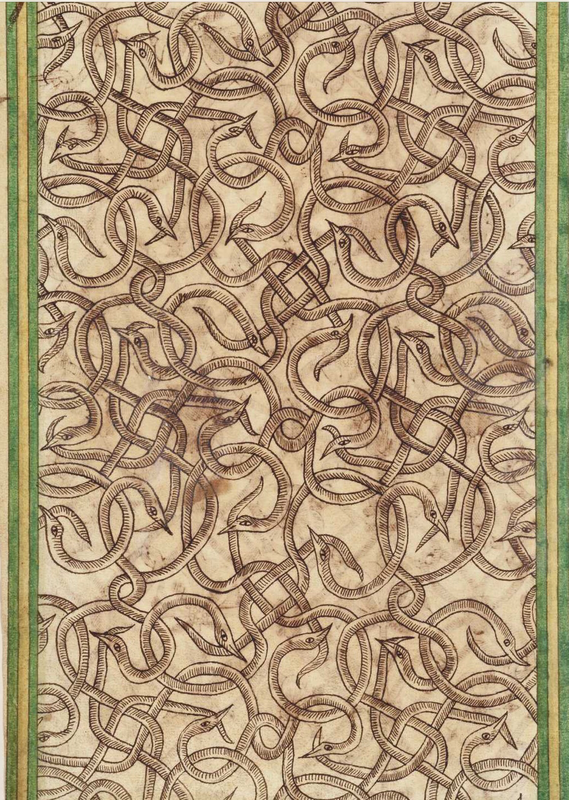 It&apos;s so uninteresting to look at unfinished that I won&apos;t even bother posting a picture of it (it&apos;s literally a strip of green silk that I&apos;ve been hemming my hand for AGES), but what IS interesting is some of the images that I&apos;ve been looking at for research. Most of them I didn&apos;t even have to find myself – someone on the internet has ALREADY put together a page of images of 17th and 18th century lute straps. Apparently there&apos;s lots of uncertainty about how some of these straps work – how long they were, how they were attached, etc. There&apos;s evidence for both a long strap worn over the shoulder like a modern guitar strap and a shorter tight strap made of stretchy animal gut (like what instrument strings were made of historically) that could be looped over a waistcoat button or pinned to the front of a lady&apos;s gown. I&apos;m going for the former, since the materials are more easily accessible (and I like the look of the giant bows on the bottom of the lute!). The strap I&apos;m working on is olive green silk, so it will probably look very similar to this one. That&apos;s what I&apos;m working on right now! My other current project is a new smock for my Elizabethan outfit, which I&apos;m hoping to finish in time for my trip to the New York Renaissance Faire in a few weeks. Hello, gentle readers! 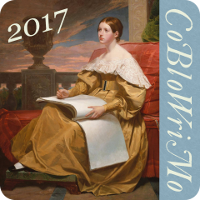 It’s been a pretty crazy year, in which I have neglected my blog, but now that CoBloWriMo has rolled around again, I’m going to take this opportunity to start writing again. To all newcomers, welcome! To old friends, welcome back! So here’s a brief introduction: Hi! My name is Mem. I’m 25 years old. I’ve been sewing for ten years. I went to undergrad for costume design and grad school for fashion history. 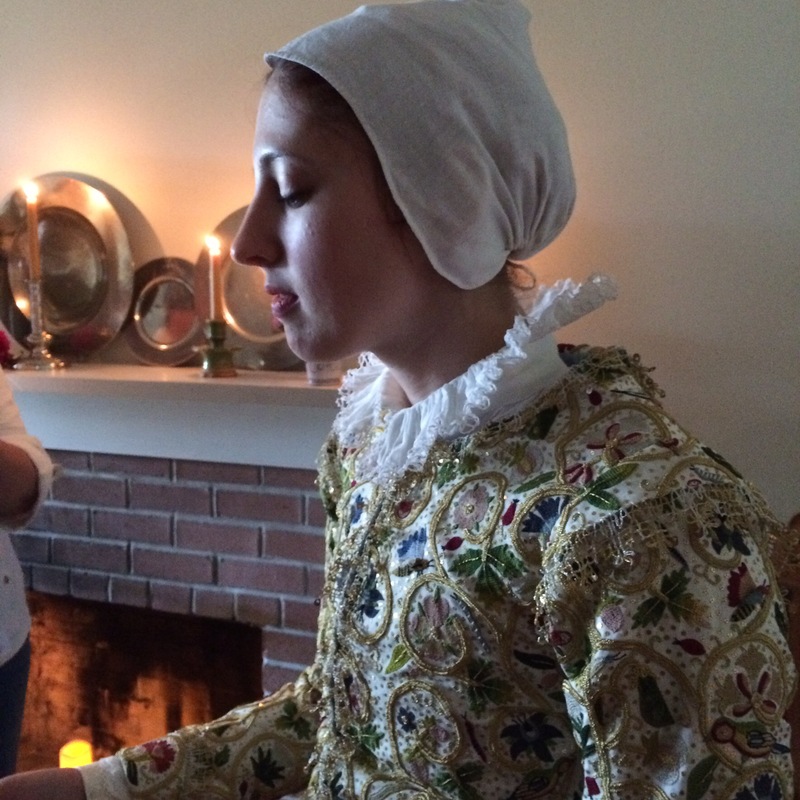 I currently work at Plimoth Plantation as a living history educator, where I get to portray a real person from history and demonstrate early 17th century daily life activities to the general public. I’ve also worked at Colonial Williamsburg and the New York Renaissance Faire. 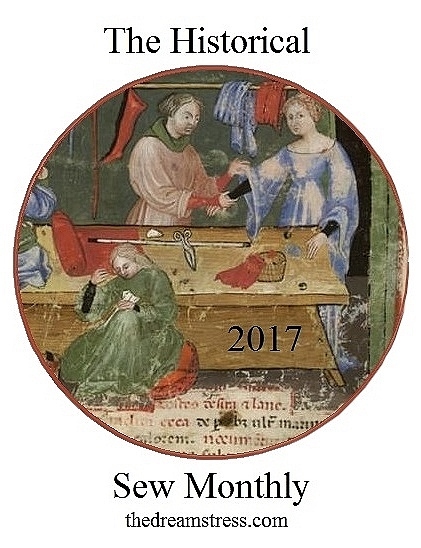 I mostly sew for myself, and I mostly make historical clothes (though I do every once in a while go through phases of making wallets and iPad cases and stuff like that too). I also knit, crochet, spin, and embroider, and I love trying out new crafts. My most favourite historical activity other than sewing is dancing and music; I love singing at events and going to balls (I haven’t been to any since I moved to Massachusetts, but I’m hoping to remedy that before the end of the year!). I’m looking forward to getting back into writing this month, and getting to know my fellow CoBlers! More to come soon! Another fun filled day of new techniques from the past! 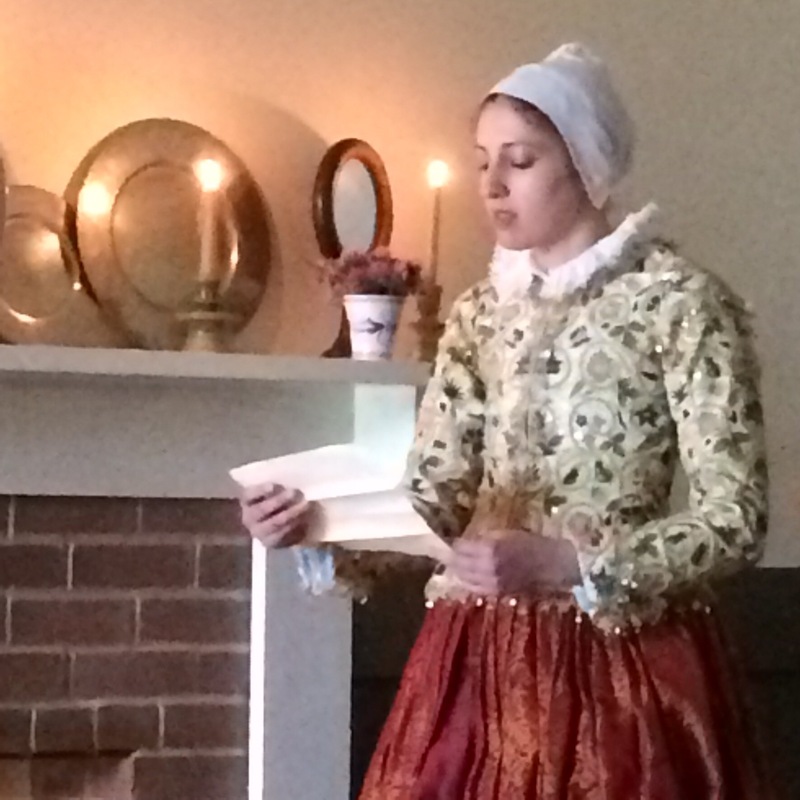 This morning, we started with a bobbin lace demonstration by Plimoth interpreter Kate Moore. She even set up a basic pattern and let us each try out a few basic stitches! 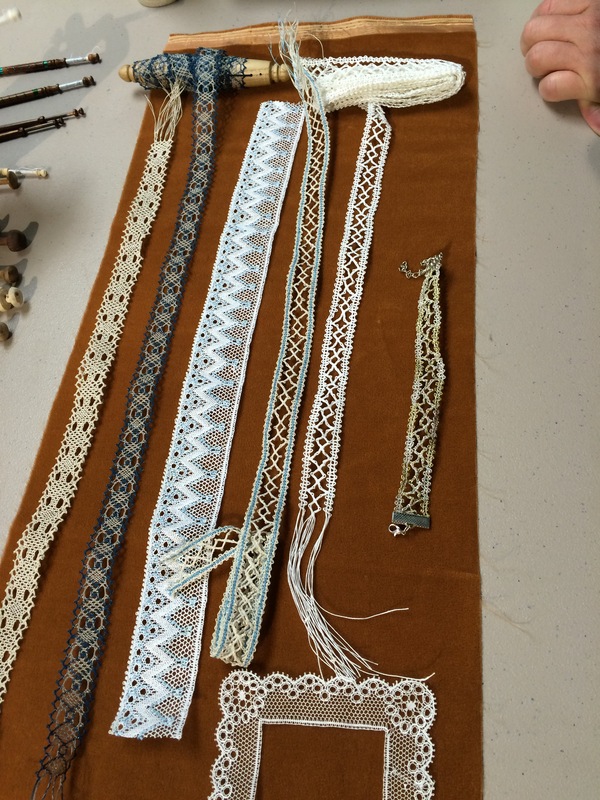 I was super psyched about this because lacemaking is the next craft on my list! And I actually really enjoyed trying it out, which was good to know. So…new craft hopefully coming soon! Yay! After that, we had some time to work on our samplers before lunch. Here’s the embroidery squad! 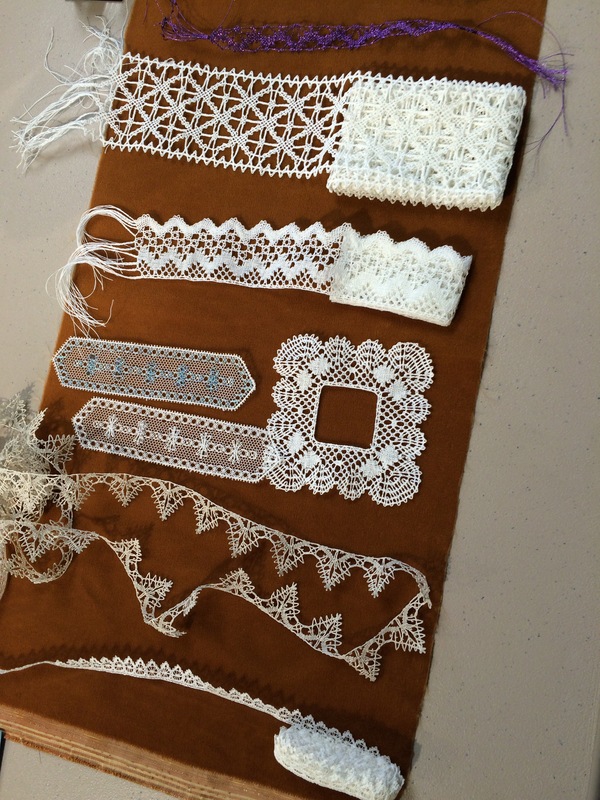 During lunch, a lovely woman named Kim taught some of us how to do the plaited braid stitch, a super fancyface goldwork stitch that’s really common in 17th century embroidery for doing all of the beautiful scrollwork, stems, etc. 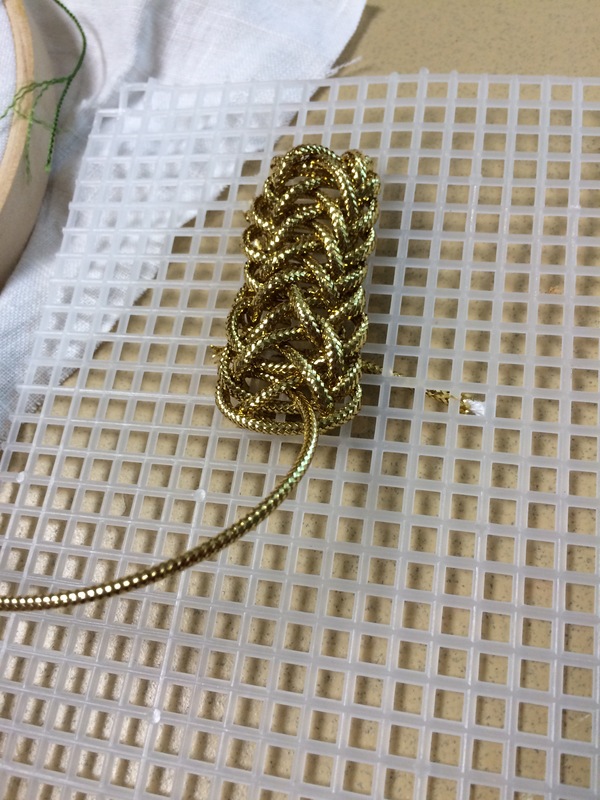 Her method of teaching it was pretty brilliant – instead of trying to get a bunch of beginners to do an intricate stitch really tiny and waste nice materials, she taught us on plastic canvas using big gold cord! 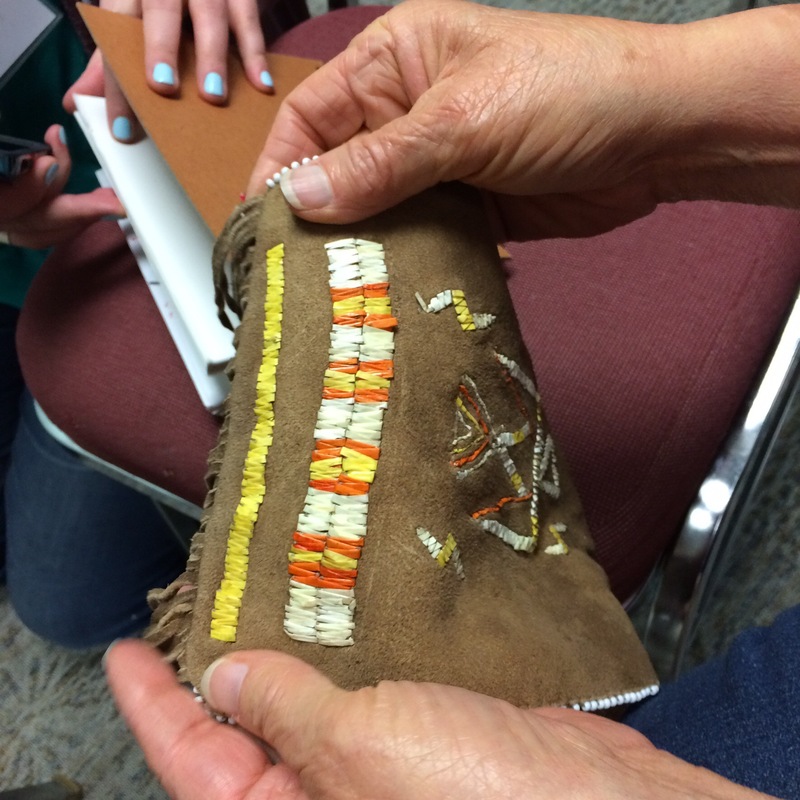 It was so much easier to see, and helped us understand how the whole stitch goes together. I’m definitely going to have to give this stitch another shot tonight to see if I actually absorbed it! In the afternoon we got a tour of the wardrobe department! 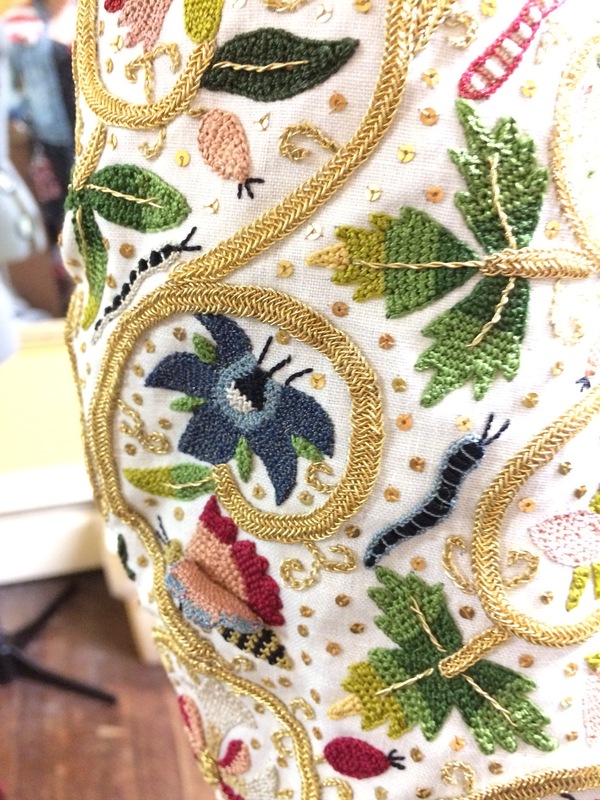 We saw a bunch of the embroidered pieces they have in their stock, and some other fun stuff – including a scrapbook of photos of the Plantation in the 70s! 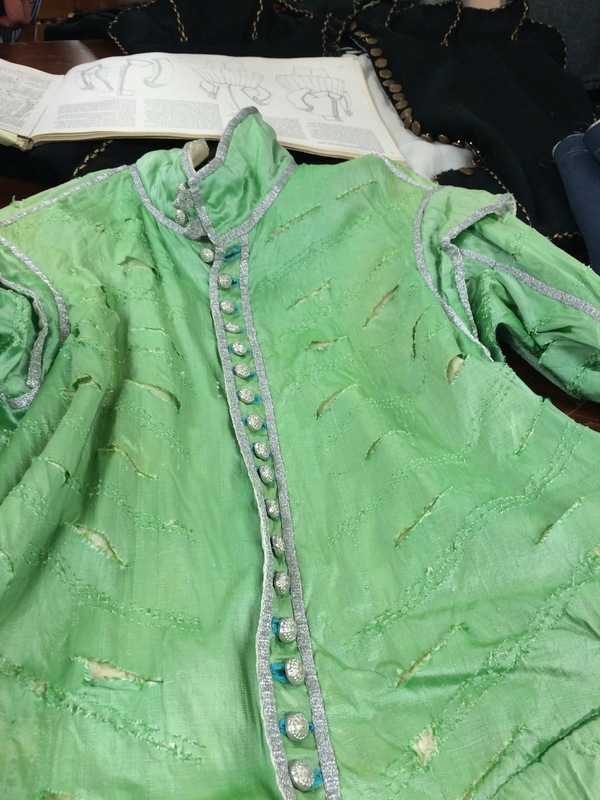 This hilarious electric celery doublet was apparently built for someone portraying a gentleman who went off course sailing to Virginia and ended up in Plymouth. I love the idea of a fop pilgrim. 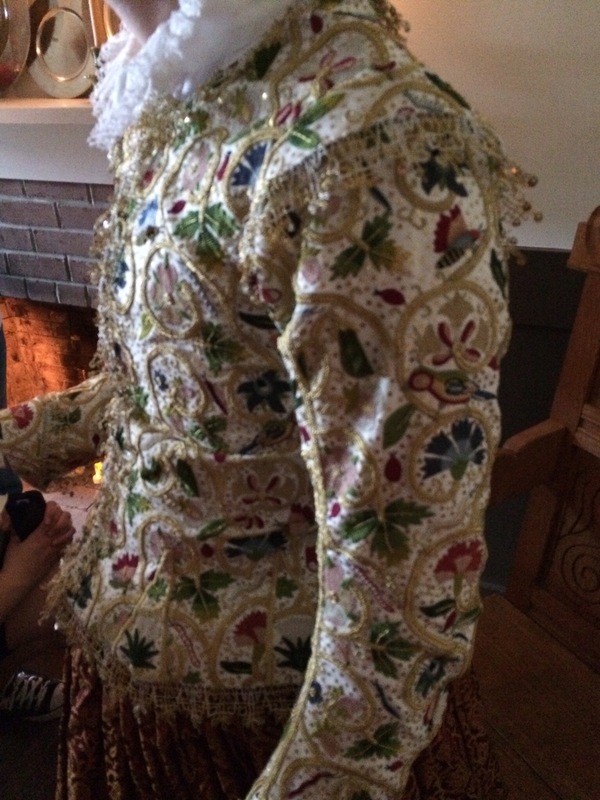 We also got to hang out with the Plimoth Jacket some more, and get some photos up close and personal! 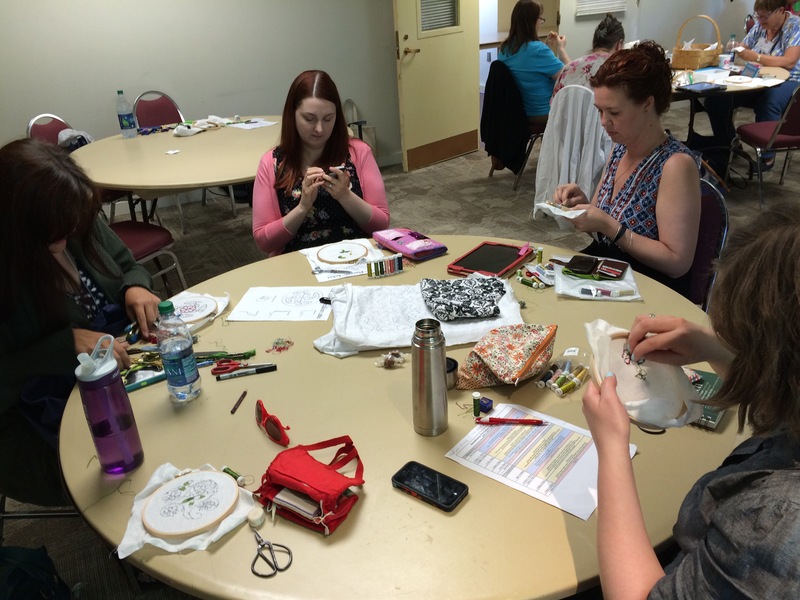 Our last workshop of the afternoon was making buttons with Dan Rosen. 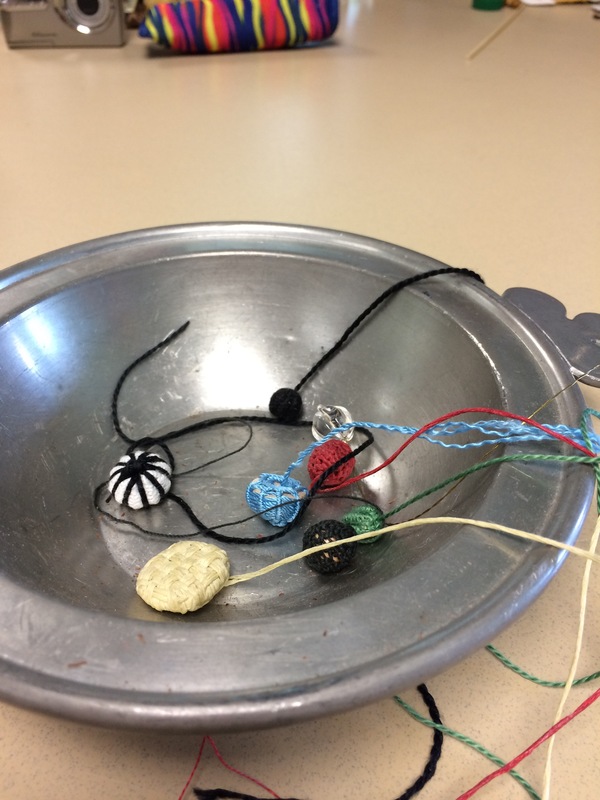 We learned how to make one very common style of thread wrapped button with many variations, and a more decorative style of button that’s covered with a basket weave pattern. These are my buttons! They came out ok! Especially the woven one. 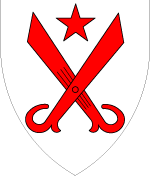 This week, though, I have to get my summer project started – I’m building a gown for a new Guilde of St George member who will be portraying Blanche Parry. Stay tuned! 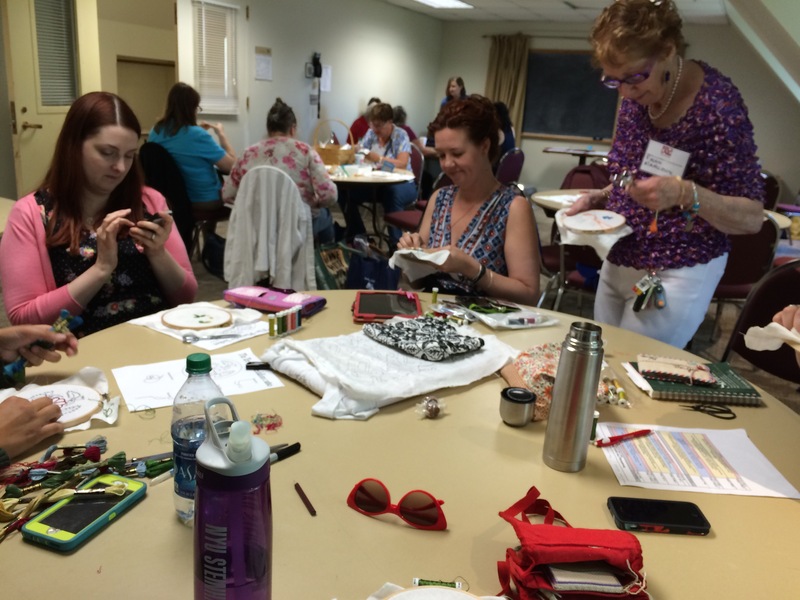 Today was the first day of Plimoth Plantation’s Embellishing 17th Century Dress conference, AKA a weekend of historical embroidery! It’s always fun to sit in a room full of people just as nerdy as you are. 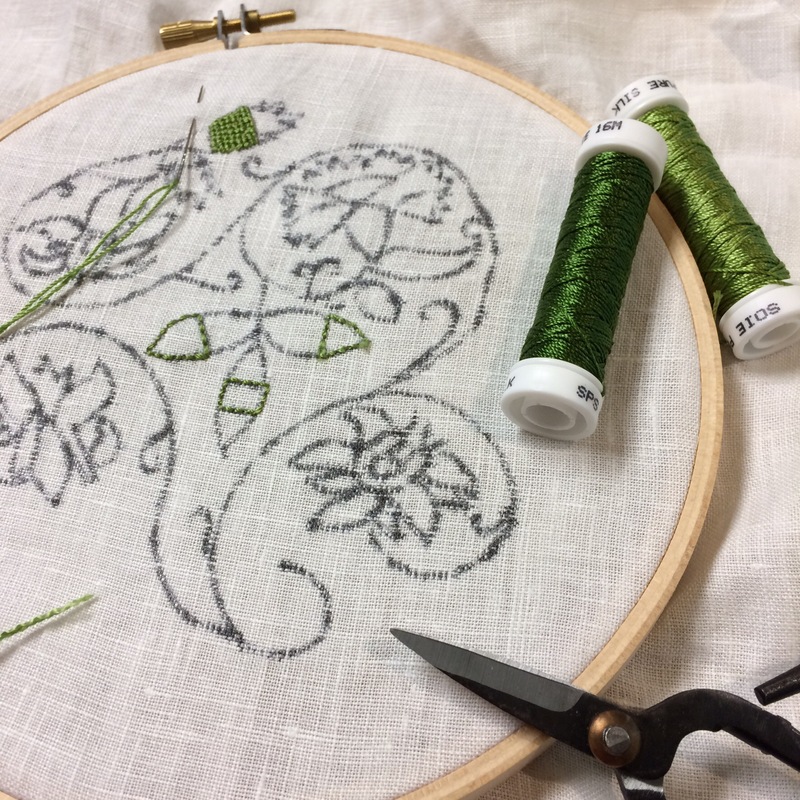 Our project for the weekend is a sampler of 17th century stitches in the form of common motifs taken from period sources. 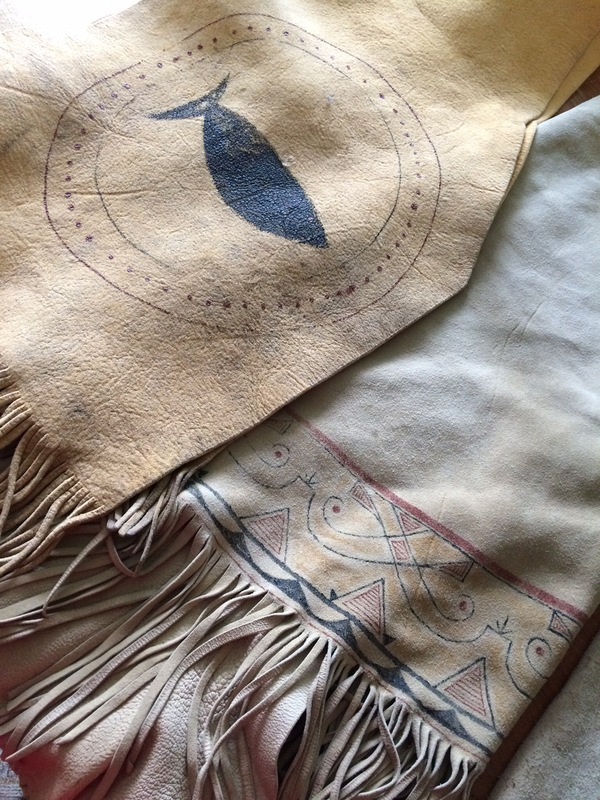 I’m working on a motif that was used on the “Plimoth Jacket”, a beautiful reproduction embroidered waistcoat they made at Plimoth in the late 2000s. I ran out in the middle of an embroidery session for an interview so I didn’t actually get too much done, but it already looks a lot nicer than the last time I attempted detached buttonhole stitch! We also had some very interesting sessions with other specialists from around the museum. 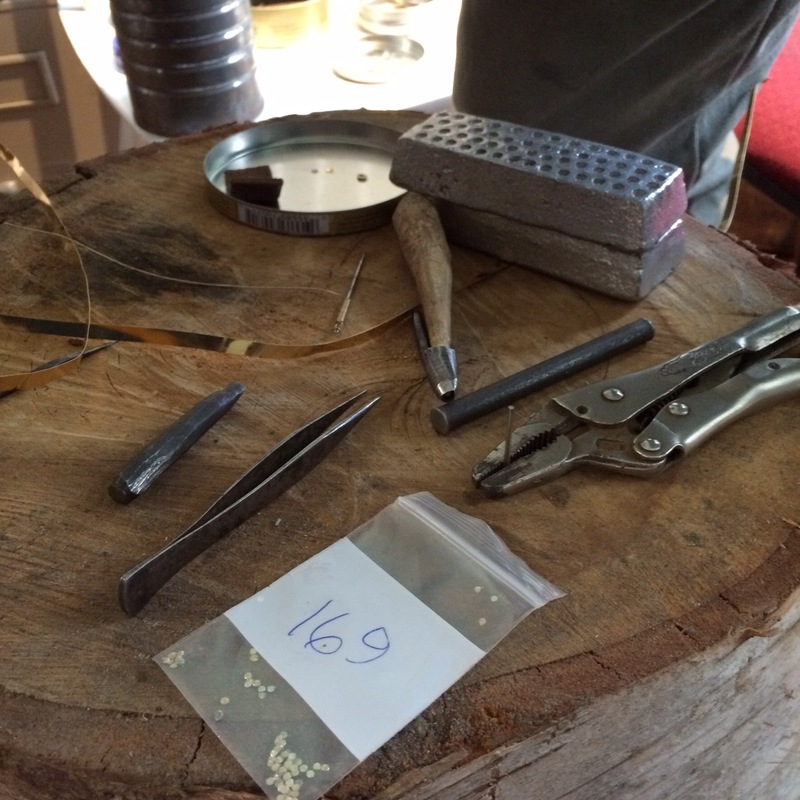 First, we met with Mark the blacksmith to talk about making spangles – silver gilt metal sequins! 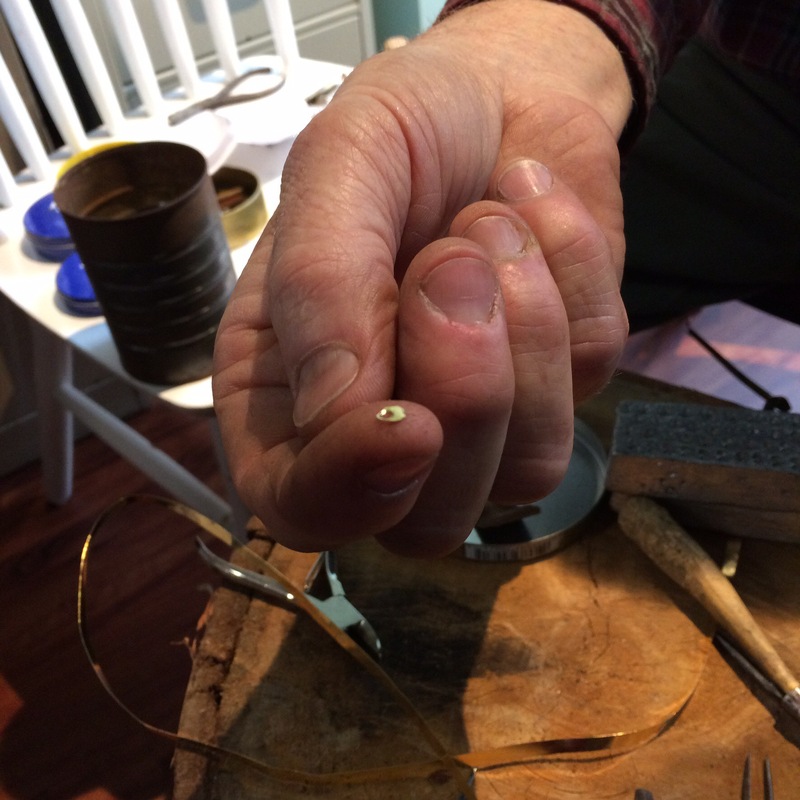 He made the reproduction spangles for the Plimoth jacket; they’re punched out of silver wire that has been plated with gold and flattened out, and they’re less than 1/4″ across. 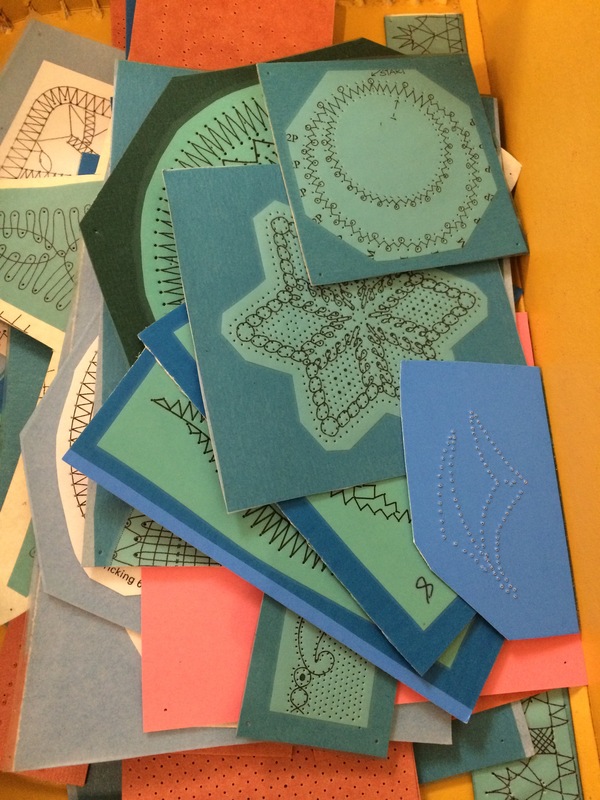 The little bag is holding the bits that were punched out of the holes in the spangles; they’re 1/16″ across. 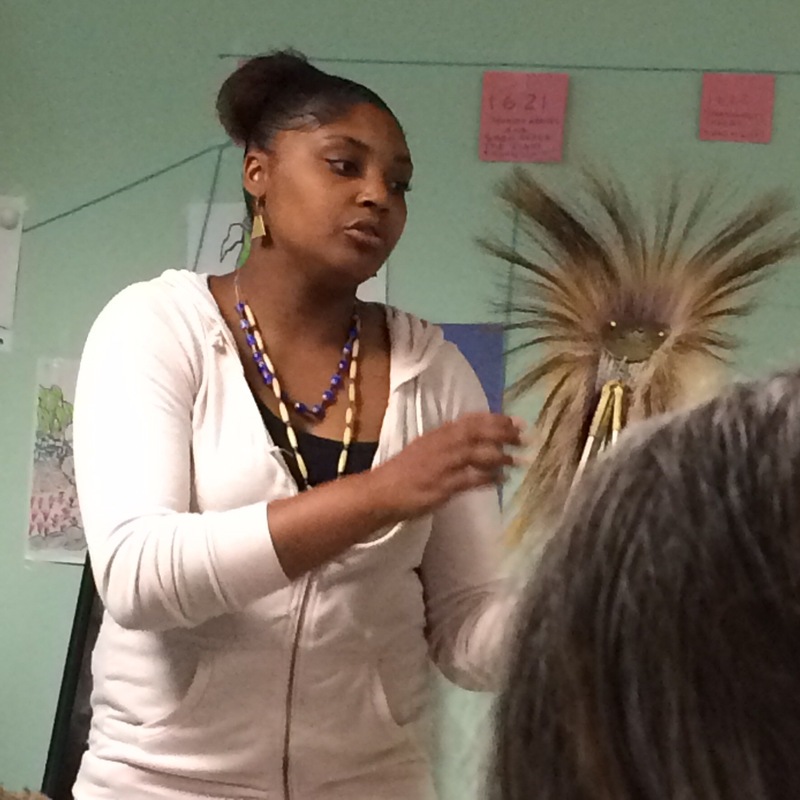 After we talked to Mark, we heard from Talia the Wampanoag wardrobe specialist about Wampanoag garments. In the evening we had a lovely cocktail hour, featuring a viewing of the Plimoth Jacket. Apparently this was the second time ever that it’s been on a person! 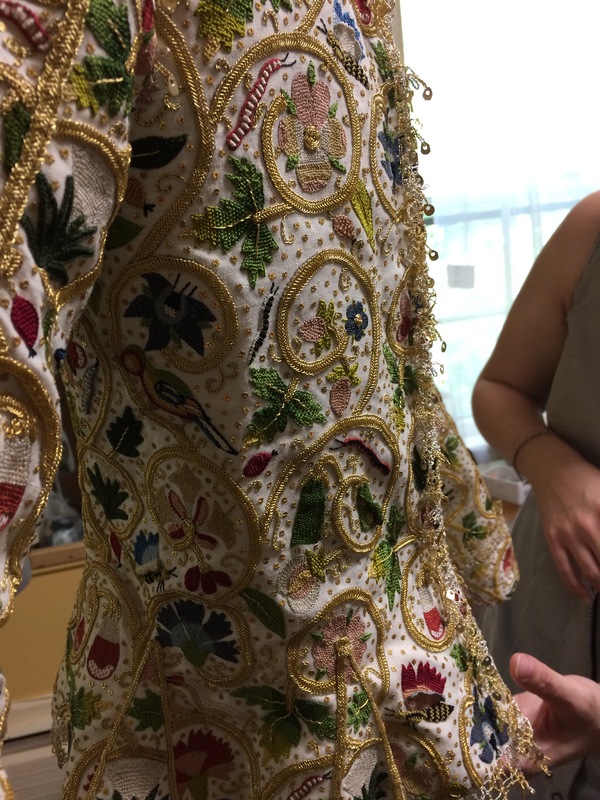 The jacket is gorgeous, and they lit the room with candlelight in order to show off the full effect of the embroidery and spangles. The first day of the conference was absolutely lovely. 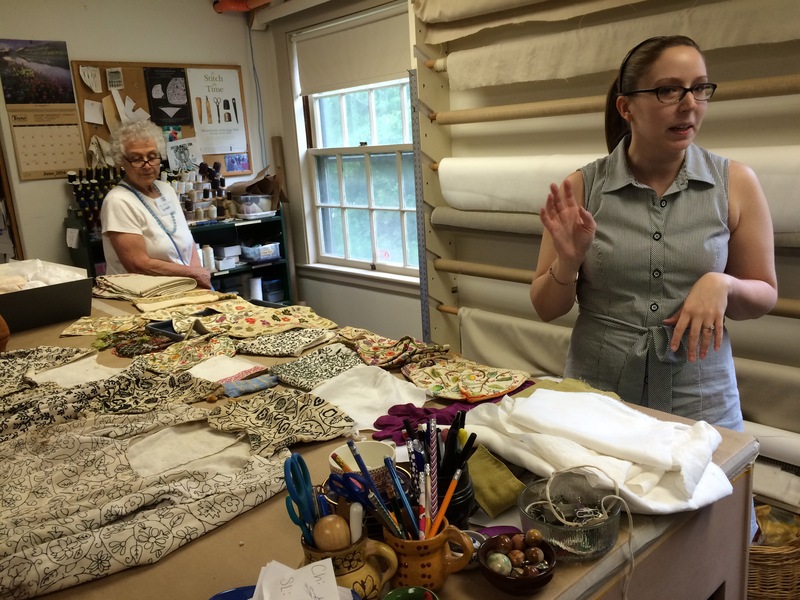 I’ve made a bunch of new friends, including fellow CoBler Carrie, who worked on the Plimoth Jacket! 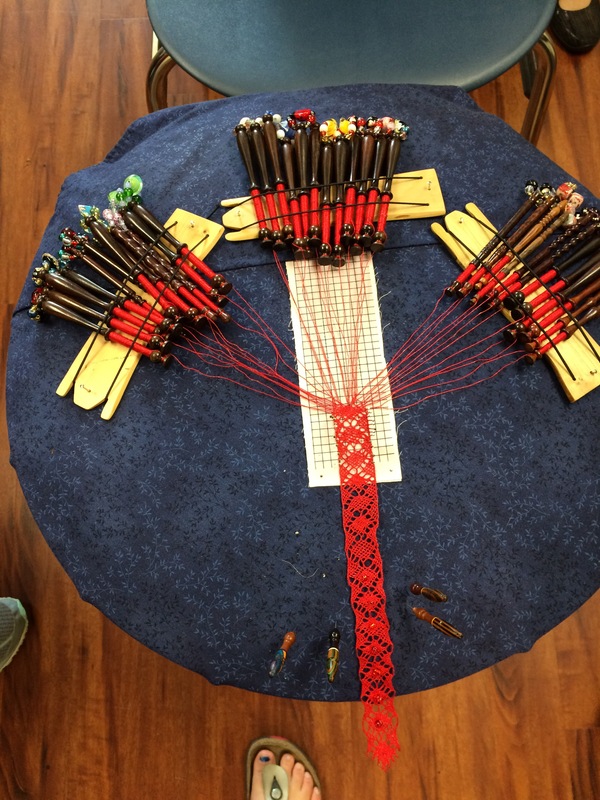 I’m super psyched for tomorrow – especially for the lacemaking demonstration! For this evening, though, I’ve got a date with pizza, embroidery, and the jacuzzi tub at my Airbnb. Good night for now!